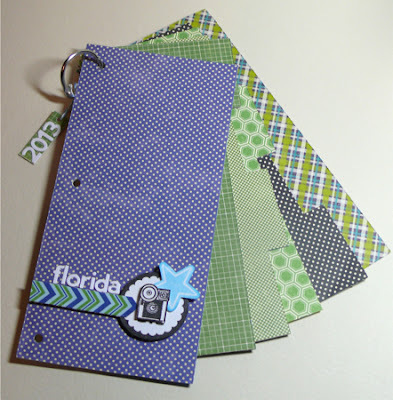 Hampton Art Blog: 2 cards by Britt Bass and a quick and easy mini album by Kim Frantz! 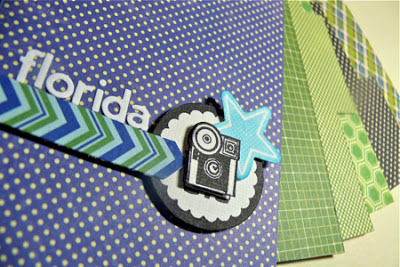 2 cards by Britt Bass and a quick and easy mini album by Kim Frantz! Hello! Britt Bass here today sharing with you a card using the 7gypsies Liscensed stamp set, “Under and Sea” and some Clearsnap pigment ink! 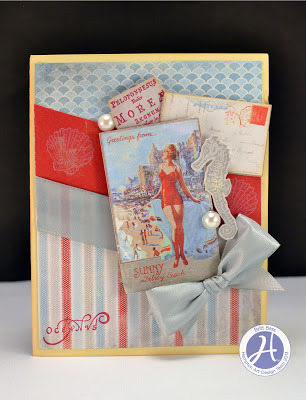 I thought these stamps worked so amazing with this soft, summer paper. The paper I used had a little cut-apart page of ephemera and one of my favorite uses for icon stamps (as opposed to letters or phrases) is to create extra ephemera for my projects. I used the seahorse and label (stamped in red) which I cut out and added to my little focal collage. Then, I stamped sea shells onto a piece of the red background paper to add some depth. Finally, before I was done I added a word stamp to the corner to balance out the design. Hello! Britt Bass here today sharing with you a card using Ki Memories “Best Friends” collection and a Jillibean Soup liscensed stamp set from the “Chilled Cucmber Soup” line, stamped using Doodlebug design liscensed pigment inks by Clearsnap. I simply love the latest Ki Memories Mini Celebrations! This card is made using a piece of the double-sided cardstock that has journaling cards printed on one side and a pattern on the other. It was super simple to cut both the notebook pattern and the zebra from the journaling card side and then pop on a Ruffle Sticker border and sentiment from the same mini theme. Finally, I stamped my butterflies, cut them out and layered them with some buttons and twine before attaching them with pop dots. Easy-peasy! Patterned Paper: Jillibean Soup (Country Pumpkin Chowder/Yellow Potatoes, Winter Tortellini and Spinach Soup/Fresh Basil, Fresh Vegetable Soup/Bite Size Bits, Irish Farm House Soup/Sliced Turnip, Macho Nacho/I Part Man, Soup Staples II/Navy Salt and Black Salt. Bean Stalks: Jillibean Soup/Blue and Green Twine. Stamps: Echo Park Paper Co/Oh Snap. The cards are awesome and the mini-album is so cute. Really great job, designers. 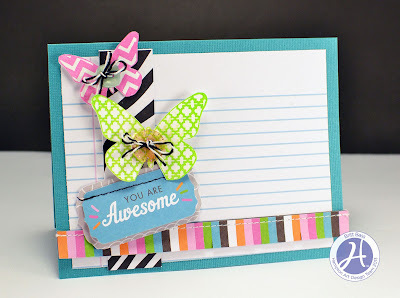 I like the use of notebook paper on your "you are awesome" card. Britt, I love your beautiful card!! It is so my style!! Have pinned it too!! Look forward to seeing more!